The American Gothic Revival movement began around 1840 and continued for about thirty years for houses, much longer for churches and schools. 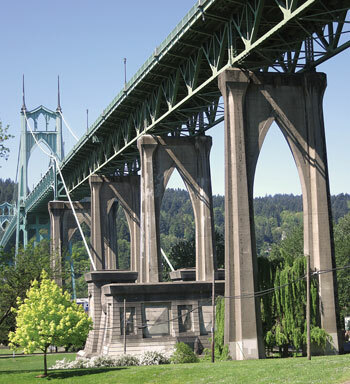 Though early Portland was once filled with Gothic Revival houses, none exist today. Gothic style houses, together with houses in the Greek Revival style, were built in those central city neighborhoods most likely to meet the wrecking ball from the ever-expanding downtown. 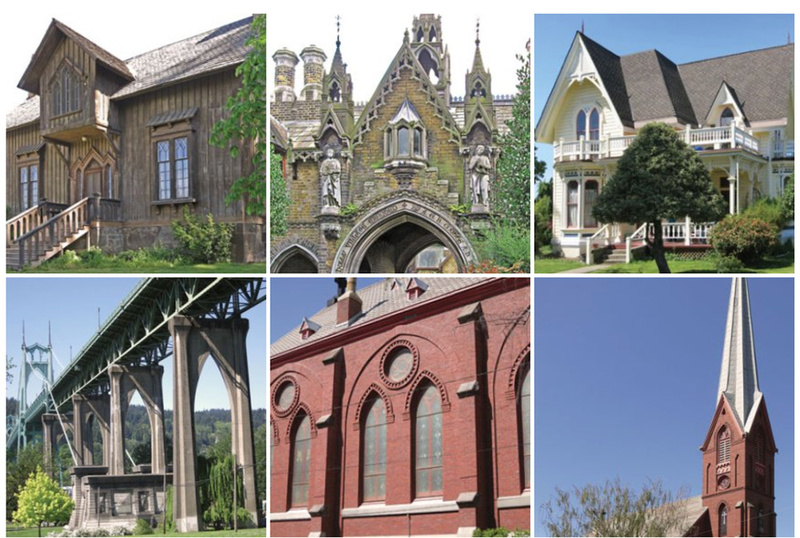 Other cities in Oregon, those that did not experience Portland’s explosive growth, still retain a number of Gothic style houses. Portland scores better than most, though, in the number of impressive Gothic Revival churches and educational buildings still in existence. 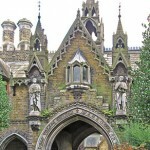 In this country, Gothic Revival buildings, especially houses, were executed in a much lighter mood than their British counterparts . First of all, most American houses were made of light wood frame construction, sometimes referred to as Carpenter’s Gothic. In Britain, most houses were made of masonry or heavy stone. 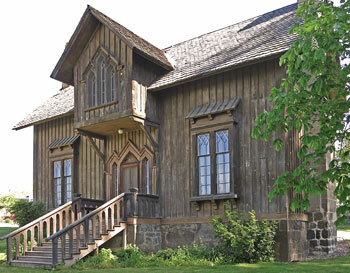 American Gothic wood houses could be painted, often in soft, earthy hues. It was the first American house style to use color as a design statement. In Britain, the porous masonry surfaces of Gothic houses, already dark, became even darker after absorbing coal smoke and other pollutants. Also, the invention of the scroll saw allowed American woodworkers to quickly turn out amazingly light and lacy patterns of decorative wood scrollwork. The age of Victorian gingerbread had begun. The British employed much gingerbread, as well, but they never developed the range of open, arabesque-like designs that were so skillfully used by American woodworkers. Lastly, Gothic Revival designs were meant to reflect designs and patterns of grand medieval Gothic structures. But having no such precedents in this country, designers and builders were freer to use their imaginations to create quite fanciful forms. Pattern books in the American Gothic style were widely circulated in mid-19th Century America as guides (most by architect Alexander Jackson Davis and landscape architect Andrew Jackson Downing). But in the end, a builder of relatively modest homes could express his own creativity and judgment when applying wood-cut ornament. 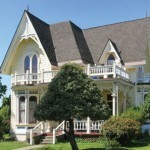 What are the characteristics of the American Gothic Revival house? Most people have come to think the most identifying feature is the presence of a pointed arched medieval window, usually placed in the center of the second story on the front façade. This no doubt comes from the association with the house in the famous Grant Wood painting American Gothic. (Is there an American alive who does not know this painting of the farmer and his pitchfork standing next to his stern-looking wife?) While this pointed lancet window is frequently found in American Gothic houses, there are other features that are just as important to the style. 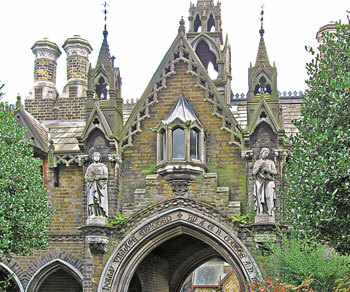 Indeed, some characteristically Gothic houses do not contain lancet windows at all. All Gothic Revival houses do, however, have extremely high pitched roofs, a feature carried over from medieval times, and in direct contrast to (and perhaps in defiance of) the shallow roofs of the early 19th Century Greek Revival houses. 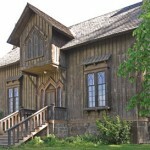 Usually, too, there is a cross gable intersecting the main roof gable at a right angle. This is usually the gable that contains the pointed lancet window visible on the front. Other characteristics include a comfortable porch or veranda with a sturdy roof and balustrade above. Sometimes the lancet window on top is actually a door that opens out to the deck formed by the porch roof below. The last notable feature of the Gothic Revival house is the heavily decorated scrollwork on the front gable bargeboards. Bargeboards are found on the edge of the gable, hanging down from the roof. 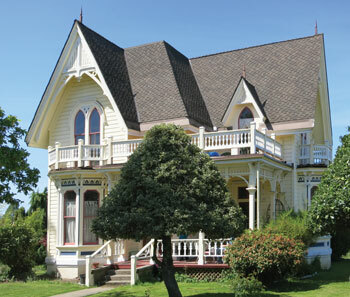 Unfortunately, most of Oregon’s remaining examples of Gothic Revival houses have comparatively undecorated bargeboards. Absent further research, it is difficult to say if they were this way from the start, or if the ornament was removed at one time or another. A house that is 150 years old has seen a lot of owners. 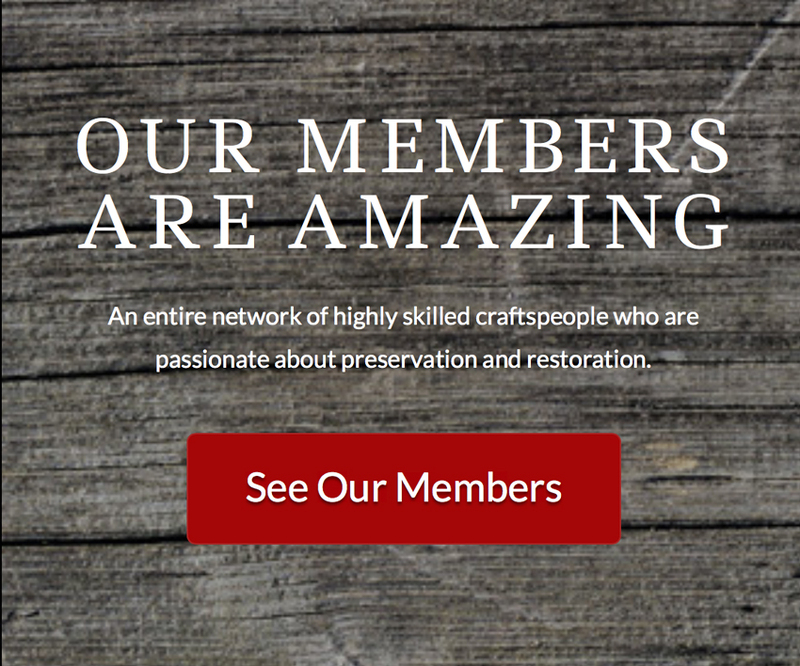 All that it takes is one owner to practice deferred maintenance, and our rainy climate can do horrors to exposed woodwork. The fashion for American Gothic Revival houses was pretty much over by the 1870s. But Gothic-inspired design continued for religious, governmental, and educational buildings right up until World War II. Portland has a wealth of these later Gothic buildings. 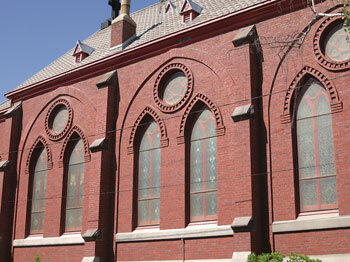 Perhaps the best known is the Old Church in downtown Portland. 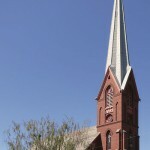 This fine example of Carpenter’s Gothic was built as a Presbyterian church in 1882. It is used today as a non-profit public events space and performance venue. 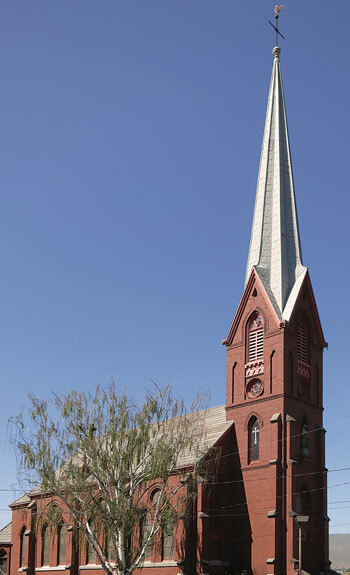 But I have chosen not to include a photograph with this article because I want to direct the reader to an even more amazing Gothic-inspired church building: Old St. Peter’s Landmark in The Dalles. 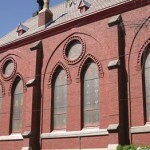 It was built as a Catholic Church in 1897, but today, like the Old Church, is a non-religious community events space. A Gothic Revival excursion to the Dalles could also include the Surgeon’s House at Ft. Dalles (built from a pattern book by Andrew Jackson Downing) and a number of fine Gothic Revival homes in the older part of town. 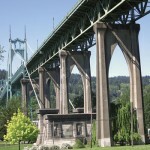 Walking tour brochures can be obtained from Historic The Dalles. You may even want to bring a pitchfork along, stand in front of a fine American Gothic house, and recreate that scene from the famous painting (sour-looking wife optional).